Tuesday was Dragobete, which I think is a holiday kind of like Valentine's Day. I had planned to go visit Kelsey after work for the Dragobete celebration there, but on my way back to work after lunch, I met some 9th graders. I said hello, but they stopped walking and very politely invited me to their celebration at our school, so of course I said yes. I got there shortly after 5:00, because they'd said it started at 5:00, and I didn't know where in the school to go, so I just followed kids going upstairs and found a classroom to go in. There were kids going in and out and getting ready, and they made sure at least one was in there all the time, to babysit me, I suppose. I said I'd just go to where the thing was if they told me where, but they said, No! It's not ready! So I waited, and some teachers showed up to try to hurry them along.. Which didn't work. Eventually one of the boys took me downstairs to a cafeteria-like room and I sat down, but not where he wanted me to, so he moved me and left for a second. 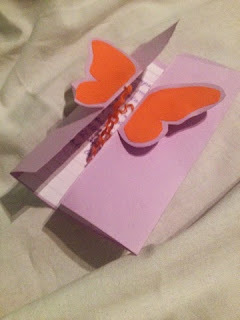 He came back with a chocolate bar and the cutest handmade notecard from his class. It thanked me for coming and said that they hope the evening's traditions will fill my heart and soul and was basically the cutest thing ever. 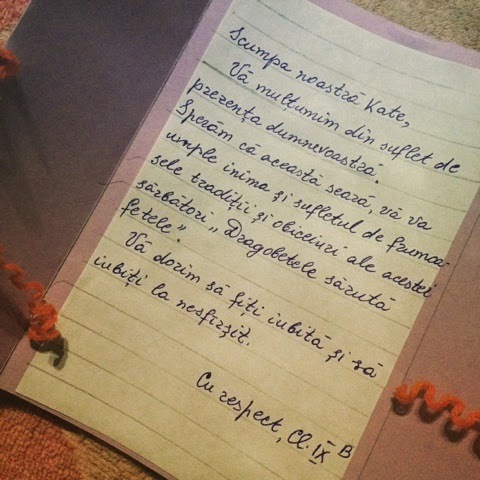 My favorite part is: "Vă dorim să fiți iubită și să iubiți la nesfîrșit." AKA, We wish that you will be loved and that you'll love forever. HOW CUTE. I almost cried, obviously. It was a rather long celebration but it was very cute. 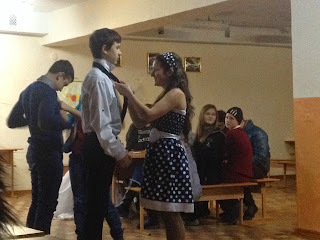 There was singing, love poetry, skits, games.. And the night was a competition between couples from the different classes, scored by some of the teachers. 7th grade won, which I supported, because they were adorable. The MCs went around with a microphone at one point asking people what they thought love was, so OBVIOUSLY they asked me, and told me to do it in English.. Which I don't know if anyone understood, but that turned out to be a good thing because I had no idea what to say and probably sounded like a moron. 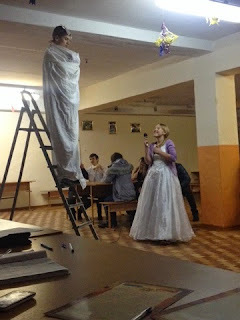 It was also relatively dark and I didn't have a very good angle, BUT I did take one or two pictures of what I considered highlights: a girl in a wedding dress talking to a boy on a ladder, and my favorite, a competition where girls raced to tie the boys' ties the fastest. The kids were adorable and I think they had a lot of fun! It was fun to see, too. I didn't stay for the dance afterwards, as it was past 8:00 by then and I'm an old lady, but I imagine that was pretty exciting too. Happy Dragobete!